All I could envision then was a graph with a series of spikes on it, showing how all the big words from this Canadian story all surged just prior to the event. I planned to do a quick article about how these dormant dream words just came alive in the days leading up to the Canadian shooting, and all the words just happen to describe this event very well. I scanned the text very quickly and then went for the pictures. Strangely, the phone camera that allegedly recorded all the video that day inside the parliament just happened to have identified several camera crews all operating and scurrying around before the police showed up. The aforementioned article hypothesizes that the whole scenario was staged because how could news media (the guys with those huge bulky professional camera gear) already be present AND operational when the first responders haven’t even made it to the scene yet?! Yes, I agree…right now this graph looks irrelevant, insignificant; however, there are some real jewels in here, and I’ll walk you through those now. It’s true that Fake could be associated with just about anything, and by itself this word is absolutely useless to our story. However, it follows the same pattern as all our other descriptive words, especially with that double-pop pattern compared to Guardian. Now “Media” is an entirely different story. This word started out completely dormant and then went blazing to the moon in two tiers. Thus, it managed to evade our radar because of this incremental climb (and thus we’ve adjusted our math a tad to better pick up these types of movements in the future). In order to fully appreciate “Media,” we really need to see the old chart first. 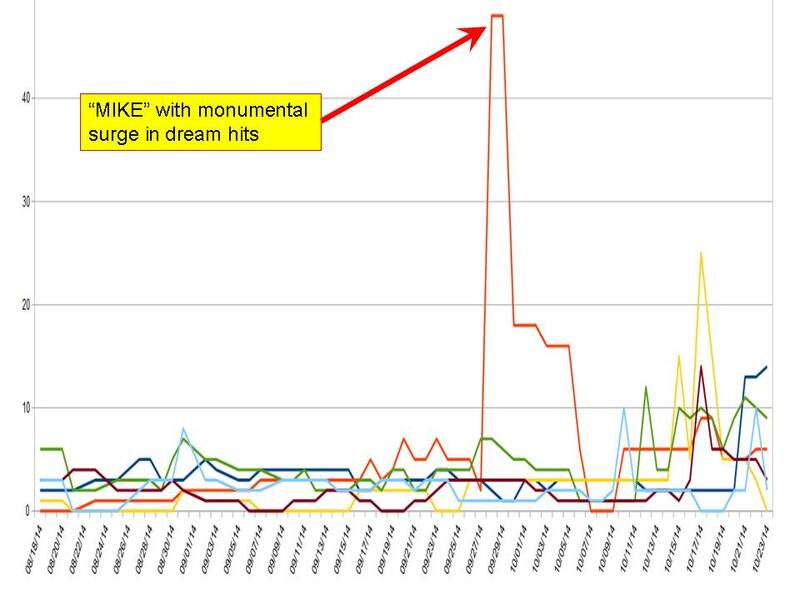 Notice how our main character in the Canadian shoot-em-up news story is named “Mike,” and thus the main character in our previous graph is the same….”Mike,” as indicated by the huge red spike. Who is the main character of our investigation now? Media. And in that same graph, notice that I listed all the words that pop up in the lower right. I listed them chronologically (i.e., in order of when they popped in the collective dreams). 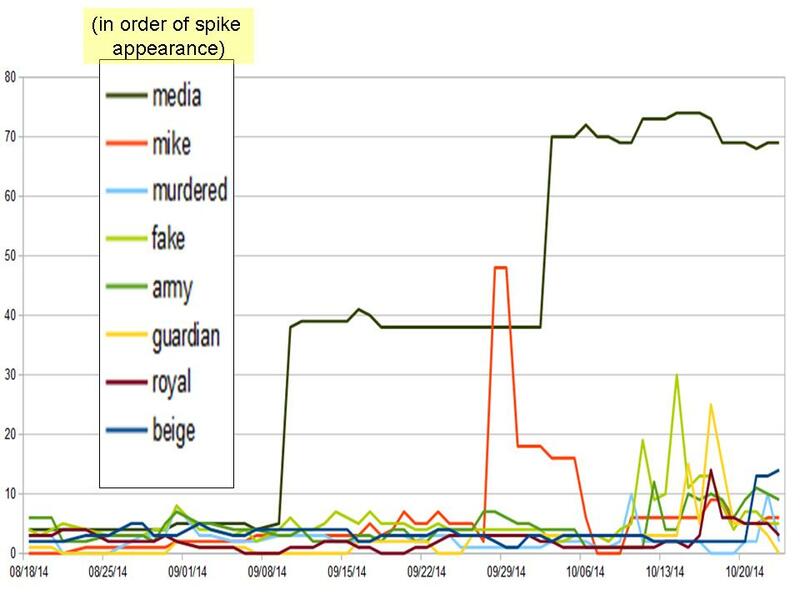 Reading straight down the list is rather meaningful: [the] media [reports that] Mike murdered a fake Army guardian [of the] royal [Canadian military and abandoned a] beige [vehicle]. 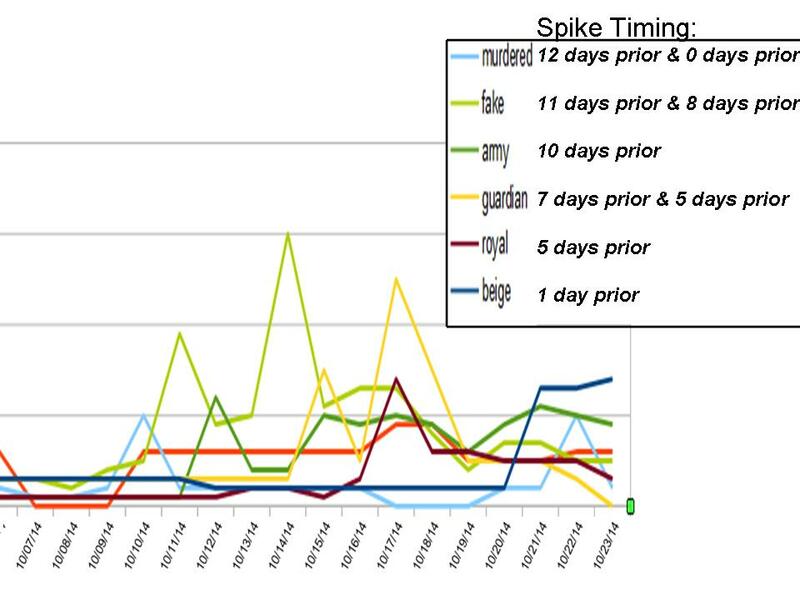 In this chart, we can see WHEN the spikes happen in relation to the news. For example, the light blue line (“Murdered”) spikes 12 days prior to the news. We’ll also be looking at the TYPE of words and when they rise and fall in relation to the big news stories. For example, is there any coincidence that Mike and Barry both surge big-time 23 and 19 days (respectively) prior to their big international headline? The average of those two is right at 3 weeks (Barry was the corrupt rabbi we covered in an earlier article). We’ll be looking at specific patterns and matching those up with timing as well. For example, “Fake” and “Guardian.” In the mainstream versions of the story, there’s obviously no evidence of “Fake,” but “Guardian” is probably the main piece to the headline. Therefore, should “Fake” also be given the same priority since it shows up with the exact same pattern at a similar time prior to the event? Certainly, we can’t say with any type of certainty the answers to these questions. Only further testing, comparing, analysis, and vetting will give us a better idea for the ultimate truth here. However, what we do know is that there are quite a few coincidences here. Eventually, the coincidences might become too prevalent, which would only suggest that the collective mind does, in fact, see future events prior to them coming true. And yes, it would mean that the collective can see whether the event is staged or not! Chris your work here is utterly amazing – just goes to show how one turns a negative into a positive – and not only did you do that, the learning scale was tremendous. I love it~@!!! Thanks for stopping in, CJ! Thanks for the compliment…means a lot, but it means even more coming from you! I wish you would produce a dreams for dummies publication explaining just what your saying about dreams. I understand about 25% of whats written and most of that is how to join, and how to put in your dreams and then it stops! After that I become loopy trying to figure out what is being said. Good example>>>>>>>>>>>>>What is a DreamBot??? ?